Fitbit company is all set and ready to give a back to back blasts. This is a way used by the Fitbit company to stay strong in the marketplace of the smartwatch. It’s been just a year that Fitbit had to launch the Ionic, and now it is with a brand-new product. To get in detail Fitbit Versa review, WorkoutGadget can be your best stop. ​Before moving on to the new product launch by fit bit let’s see how the previous product was. The Ionic was not exactly the device that people were expecting it to be. Because of its flaws, this smartwatch ​could not withstand the huge pressure of the market. This is the latest ​creation of ​this company after Fitbit Blaze,​Click here read Fitbit Blaze Review. I guess Fitbit company is hardly trying to follow the well-known saying “try, try and we succeed “. If this is something they are into they it’s a really good motivation and we have a lot to learn from their willpower. The Fitbit Versa is a redefined product when comparing it with lonic. It even looks better when it comes to the appearance of it. The ​Versa has wonderful battery life and its tracking capacity is really good. The​y must still pay a keen attention to the processor managing department of the smartwatch. Comparing Fitbit Surge, Versa has revealed many more exiting features. Go here to read Fitbit Surge Review. There is a lot that you need to know about this smart watch and this is not the end of it. Let us go deep into its features to know more about the ​this smartwatch. Come on let’s dig into it. ​​They have brought forward this smartwatch to address some of the criticism that led to the fall of the previous product. This Fitbit review will give you a clear-cut idea about have they achieved what they want or even this time this is a disappointment. Starting with the screen and design, Fitbit is always sure about what they want regarding design. The design is unfussy but this is what makes it attractive. You might not be the fan of rounded square display but this won’t be disappointing you as the sleek design will steals your sight. The Fitbit Versa will look quite comfortable on you because of its slim aluminum body, which makes it comfortable to wear. In other words, it does not look chunky on your hand. This model of smartwatch is polish than the Ionic smartwatch. Regarding the brightness feature of the smartwatch it is at 1000nits, which makes it easy for to read while you are at bright light. The Fitbit Versa is available in rose gold color and silver color. Not only this you are even lucky to get different range of bands too. There are leather, woven and silver bands from where you can choose any. Let us find the specifications and sensors of Fitbit Versa in detail. One of the cons of Ionic was the unavailability of build in GPS and unfortunately, this part is even missing in ​this exciting smartwatch. You this means you cannot track routes. And this will require you to take your mobile while you are even going for an simple walk. 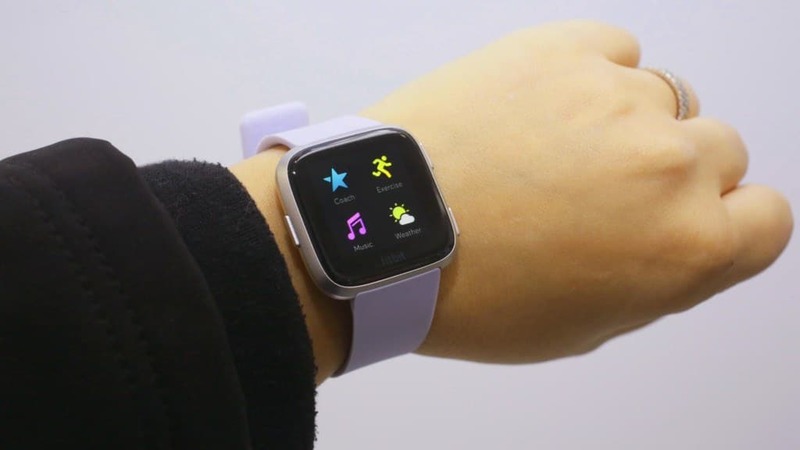 But Fitbit Versa can surely entertain you, it can store up to 300 music tracks which you will be able to hear by pairing your Bluetooth headphones. ​So, if you are intending to spend some time in the backyard you can do that without your phone and only with music. ​There is NFC chip when enables onboard contactless payments but this feature is even limited as there are only two banks that supports Fitbit Pay. On the other hand, Fitbit watch is water resistant, now you can wear it while swimming and even to the beach. While we dive into the tracking feature of Fitbit Versa, it enables a number of activities that can be tracked. It can track your swimming, running, cycling with an addition to your walk and other workouts. It even keeps a record of your steps, floors climbed, calories burned, heart rate and what not. The configurations are really simple about this smartwatch. While a customer is new to the world of smartwatch her/she finds it hard to understand, but with this smartwatch, it is easy to have a good understanding. ​The Fitbit runs on OS 2.0 which is simple to navigate and allows you to operate the features in just swipes and taps. Nothing can be simpler than this, for you to better understand it we are presenting an illustration. ​If you want to track your run all you need to do is, swipe the main screen left and then tap the exercise icon finally select RUN. That’s it, its ready for use. In this manner, you can start continuing with your other workouts. If you are interested to check your daily progress then all you need to do is swipe up the main screen and here you go. ​Simplicity is always essential to make anything enjoyable and engaging and this is what makes Fitbit smart watch different from others. As you know that Versa does not have GPS build in, so to track all these things the most important is your mobile phone. Remember to get the Fitbit app. The smartwatch even creates a competitive spirit in you, it records your target and shows you the progress that other people have attained so that you can increase the level of your workout productivity. People might think that the Fitbit Versa is unlike any other cheap smartwatch with the fitness features and I do think that Fitbit surely needs to check this part full attention. Fitbit even needs to focus on the app section of it. Fitbit needs to improve in the app sector. ​Finally, one of the successful features of this smartwatch is its battery life. The battery stays alive for up to 5 days and if managed properly then it will last up to 6 days as well. Fitbit Versa comes with a clip in charger, so when your watch is in a crisis of charge then connect it for 10 minutes and it will be fully charged. ​You can find the Fitbit Versa on the Amazon easily. according to my opinion, this is a good price set for the smartwatch as it is better looking and user-friendly. With the slick design, comfortably to use and battery life I would suggest you try this smartwatch. what Fitbit needs to take care is about the smart capability and app support.